We have a winner for the Portuguese Whitework book give-away that was announced earlier this week! Thanks to all for participating in the give-away! I read each of your comments about your favorite type of needlework – it was fun to see all the different techniques that made the list of “favorites.” Probably the greatest thing about needlework to me is the variety. With a needle and thread in hand, life can never get dull! Just love that definition of blackwork – it made me chuckle! Thanks again to everyone for participating. You can find Portuguese Whitework available through Vetty Creations in Australia, through Book Depository in the UK (with free worldwide shipping), through Nordic Needle in the US, and you can always contact Yvette at Vetty Creations to find a stockist in your own country. If you didn’t make it in for this give-away, never fear. 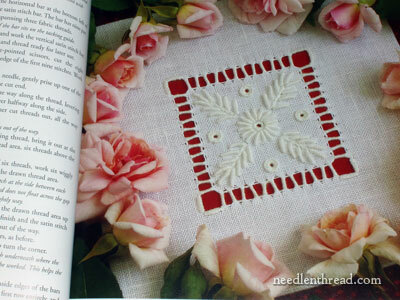 I have some other beautiful embroidery books coming up for give-aways in the weeks to come. Some of them are real gems, so look for those in the near future! Tomorrow, I’ll be posting a new embroidery stitch video here on Needle ‘n Thread, for the Up & Down Buttonhole Stitch. It’s a fun one! See you then, and enjoy the weekend! Congratulations Terry! It sounds like you will be putting this book to good use. Congratulations Terry! I hope this book brings you many hours of stitching fun. Congratulations Terry I have the book and it’s great! Mary can’t wait for the up and down buttonhole stitch. I too have Yvette’s book, I am so inspired by it! Enjoy it tracy! I plan to start with the biscornu. I agree Terry’s definition of Blackwork was perfect! Enjoy you book Terry. G;day Mary, and congratulations terryb, and thanks again Yvette for the interest you’ve created in many things, ummm, interesting to me. Not the least this book. Thanks too Mary for doing your usual wonderful job in hosting this comp.